Why would Jesus use the mustard seed instead of the legendary coco de mer palm seed for his parable? Maybe because he knew we might try to make cute little necklaces out of them like we do with mustard seeds and he was trying to save us a pain in the neck. After all, the coco de ,er palm is the world’s largest seed at over twelve-inches long and weighing over forty pounds! 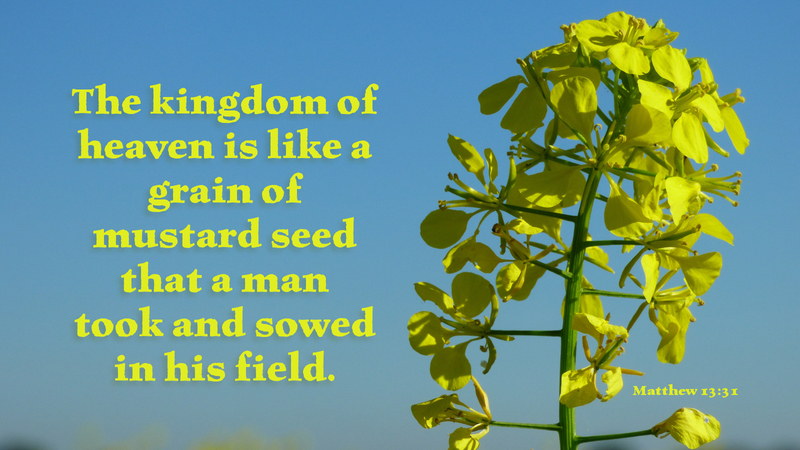 Obviously, Jesus uses the mustard seed to make a point about humility, not grandeur. His ministry had humble beginnings, but like the tiny mustard seed, it soon grew into something so much greater. The birds of the air make nests in the branches of the mustard tree and it is in Jesus’ majestic Kingdom that all who believe may come in and find rest. Prayer: Heavenly Father, use me this day to spread your love so that all may find rest in your magnificent kingdom. Amen. Today’s devotion was written by Dawn Rister, Pastor of Salem Lutheran Church, Salisbury, NC.